Equine bedding is one of the most important things to consider when caring for horses as it not only provides comfort and warmth for your animals, but it also has a great impact on the hygiene levels of your stables and therefore the health and well being of your horses. Here at P.H. Winterton & Son, we offer premium horse bedding in Cheshire and surrounding areas such as Staffordshire and Derbyshire. Our Cheshire Choice bedding, is known to be one of the best horse shavings in Cheshire, which guarantees to deliver excellent results consistently, providing an optimum level of comfort and hygiene for your horses! At P.H. Winterton Son, when your animals are happy, we’re happy! 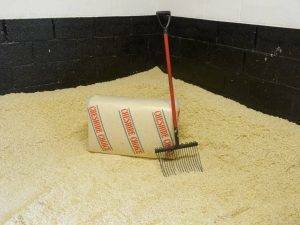 Our unique Cheshire Choice equine bedding is made from 100% soft wood shavings which not only provide an ultimate level of comfort for your horses, but also ensures a high absorbency level, keeping your stables dryer for longer. This in turn means that Cheshire Choice equine bedding is also long-lasting in comparison to other value shavings. Cheshire choice also features a unique temperature adjusting quality which means that the shavings will stay warm in the winter and cool in the summer. We also use a unique dust extraction system which keeps our Cheshire Choice shavings free from chemicals and free from dust to prevent illness and respiratory problems, both for your horses and for yourself. At P.H. Winterton & Son, we truly believe that choosing Cheshire Choice equine bedding is the best decision for horse shavings in Cheshire with regards to the happiness of your animals. Quantities start from one pallet (40) to 18 pallets (720) on request and outside storage covers can be provided if necessary. If you would like to buy our Cheshire Choice equine bedding or you would like more information regarding horse bedding in Cheshire, please do not hesitate to contact us today! A member of our friendly and professional team will be more than happy to discuss your animal bedding needs.